A hatchet is something well all have lying around the house. It’s useful for creating kindlings, to take with you when you are hiking or when you go camping. Hatchets are small and easy to carry and can be used for chopping small pieces of wood or to perform small chores around the camp. But if you are reading this, then you are probably looking for a new or the best hatchet to buy. There are a lot of hatchets available to choose from, all in different prices ranges and features. I compared them all to help you select the best hatchet for your needs. What we are looking for is a hatchet that is not too heavy, has a blade guard so we can safely carry it on our hiking trips and a perfect balance and power-to-weight ratio. At the end of the article, your will find a comparison table with all the hatches in one overview with the most important details. I have limited the list to 6 items because it won’t help your listing every possible hatchet out there. 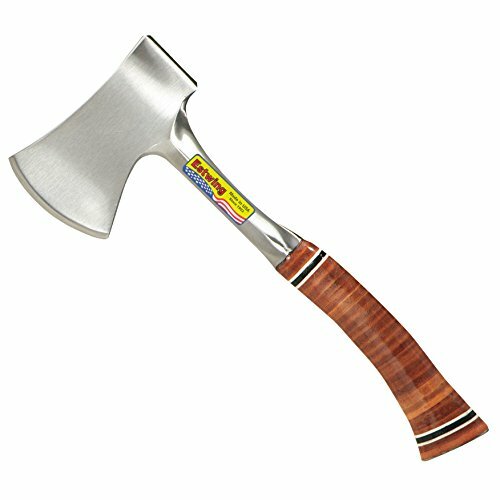 You are looking for the best hatchet, so I selected the best! A Swedish hand-forged hatchet with a perfect balance for this size. The handle is curved which force you to hold the hatchet at the end of near the head if you want more control. It came reasonably sharp, but after 5 minutes with an oil stone, it is like a hot knife in butter. The handle has a nice quality and is made from Hickory. It’s unvarnished and has a good grip. With the low price, it’s my number one hatchet to go for. 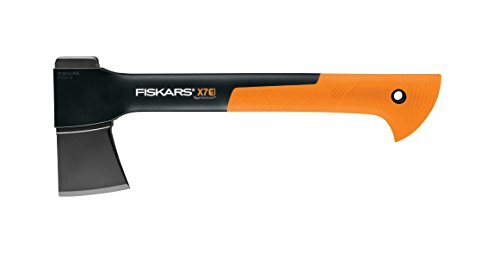 Another easy-to-carry Swedish hatchet, the X7 from Fiskars is ideal for chopping kindling and small logs. Like the other axes in the X-series, is the blade made from a stronger than steel FierComp and is the head made from Carbon steel. The head has a perfect bevelled blade design and is coated with a low-friction coating. The overall weight is low, mostly due to the lightweight FiberComp handle. The handle has a good grip and the X7 comes with a lifetime warranty. The world famous Estwing’s Sportsman’s axe, a really good choice for every outdoorsman. The Estwing hatchet is drop forged in one piece, resulting in a very durable and long lasting outdoor tool. The head and neck of the hatchet is polished and looks beautiful. The handle is wrapped in a genuine leather for a comfortable grip. The Estwing is available in two sizes, a 12 and 14 inches and is delivered with a nice nylon sheath to protect it. The Gerber hatchet is just like the Fiskars a popular choice for many. And that is not strange, Fiskars is the parent company of Gerber. So the Fiskars X7 and the Gerber 14-inch are basically the same hatchets. The only difference is the colour and name. Both are a great product, so pick the one with the best prices or which you like the most. 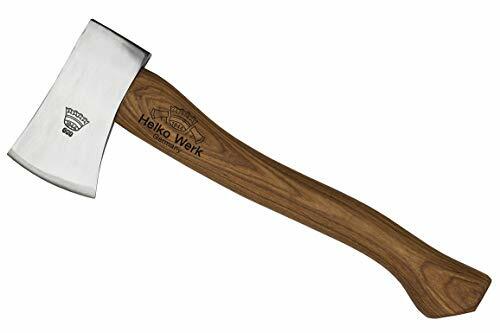 The Helko Callis Hatchet is a bit expensive, but a real premium hatchet. The Pathfinder is flawlessly balanced, beautifully crafted and really comfortable to hold. The Pathfinder Hatchet is handmade in Germany from C50 High-grade carbon steel with a fain grain grade-A Hickory handle which is made in Switzerland. The Helko is really the most beautiful and best hatchet available on the market. Another real quality hatchet, also a bit expensive compared to the Fiskar and Husqvarna, but well worth it. It has a amazing build quality, is well balanced and superior shaped head. It’s really comfortable to handle and razor sharp when you receive it. If you want a quality product, then go for the Hults Bruk or Helko and you are set for life. In the table below you will find all hatchets compared with the most important details listed.